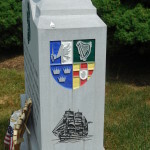 In 1832, fifty-seven Irish laborers died while working on the railroad line from Philadelphia to Columbia, Pennsylvania. The workers are believed to have perished during a cholera epidemic at their camp and were buried in an unmarked mass grave. They had been in America for only a few months, having arrived in Philadelphia on the ship John Stamp from Derry in June, 1832. Most were from County Donegal with a few from Counties Tyrone and Derry. 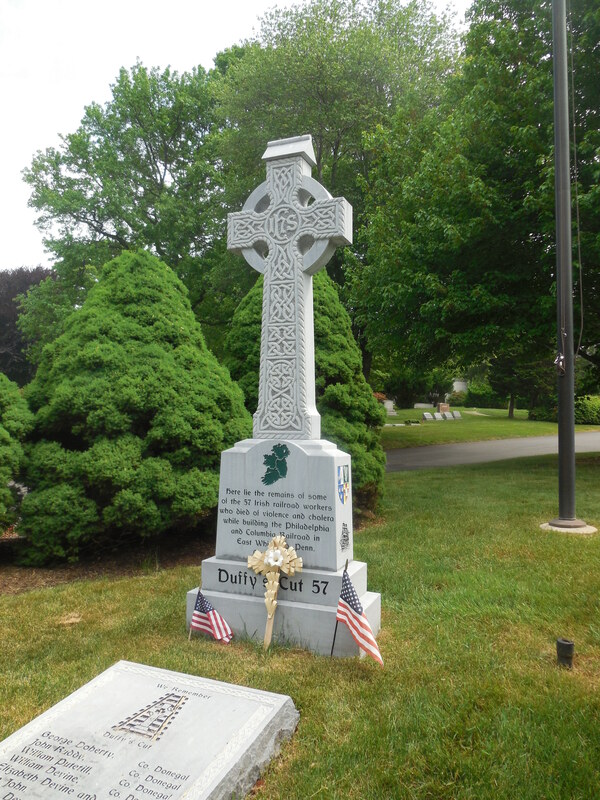 They were hired by Irish contractor Phillip Duffy specifically to make a “cut” through a hill and fill in a valley at Mile 59 of the rail line in Malvern, Pennsylvania to level the land. 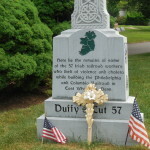 After the tragedy, the area where they were working became known as Duffy’s Cut. In 2002, two men who grew up knowing the Duffy’s Cut story started investigating railroad documents about the deaths. These men were William Watson, a professor of history at Immaculata University in Malvern (near Duffy’s Cut), and his twin brother, Dr. Frank Watson, a Lutheran minister. The railroad papers written in 1909 seemed to differ from 19th century newspaper accounts of the tragedy. The 1909 report indicated 57 were killed, but the local newspaper reported that only 8 died. It seemed to show that there was some sort of cover-up. In 2002, The Watsons began a project to find the location of the mass grave. Their project team included Earl Schandelmeier and Jim Ahtes of Immaculata University and Tim Bechtel, a geophysicist from the University of Pennsylvania. Using radar and soil resistivity methods, Bechtel was able to narrow down the search to a small area near the existing rail line (formerly the Pennsylvania Railroad’s Main Line to Pittsburgh…now Amtrak and the Septa commuter line). Digging began in in that area in 2008. The first skeleton was found in 2009 and turned over to Dr. Janet Monge, a physical anthropologist of the University of Pennsylvania Museum. She found that the skull had evidence of blunt trauma at the time of death. Through painstaking research, the skeleton was found to belong to John Ruddy, a teenager from County Donegal. Over the next few years, a total of six skeletons were unearthed. Of these, two were found to have died as a result of blunt trauma to the skull, and another was found with a gun shot (musket ball) wound to the head as well as what looked like an axe wound to the skull. The deaths at Duffy’s Cut were supposed to be related to cholera. The evidence of death from violence is puzzling. 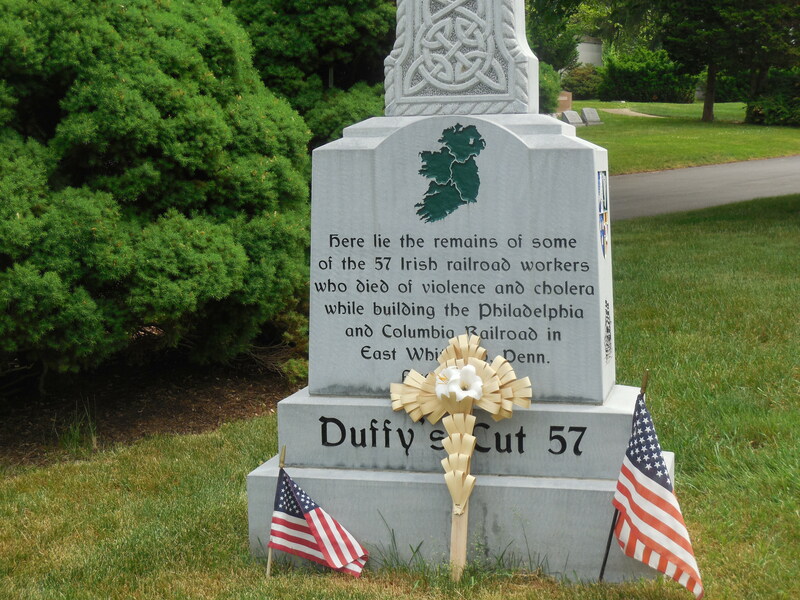 Were the deaths at Duffy’s Cut caused by cholera or murder? We may never know. Many believe that not everyone exposed to cholera will die of the disease, maybe only half. The others may have been murdered by outsiders when they tried to leave their lodgings at the site to escape the disease. Being alien Irish, the workers weren’t held in high regard in the community anyway. It is known that some tried to leave the camp but were driven back to the valley. They were treated there by a local blacksmith and the Sisters of Charity who came to the camp from Philadelphia. A vigilante group, known as the East Whiteland Horse Company, policed the area in the absence of a constable. Perhaps they were responsible for some of the deaths when they tried to protect their community from those whom they suspected as carrying the deadly sickness with them. The project is still continuing. The total number of skeletons found so far is 6. One of the skeletons was that of Catherine Burns, a 29 year old widow who travelled from County Tyrone with her father-in-law. Catherine probably was employed at the camp for washing clothes and cooking for the workers. 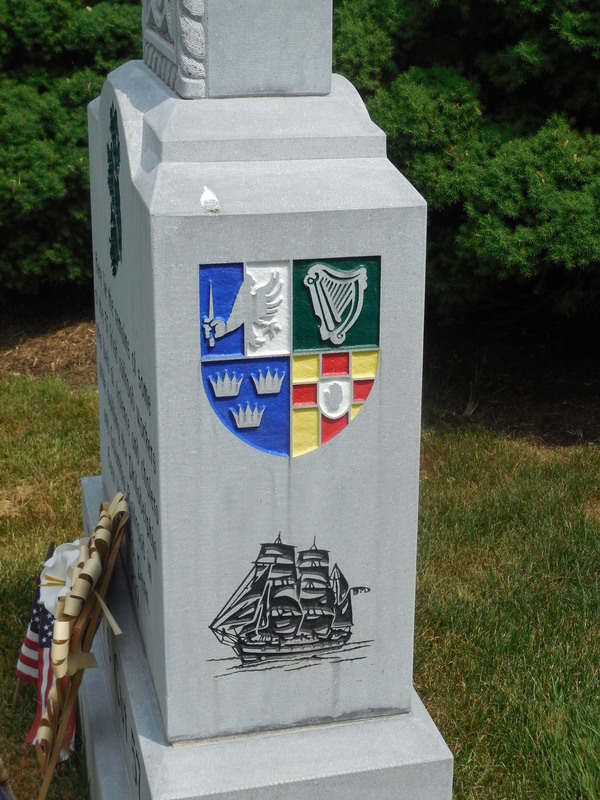 The remains of John Ruddy and Catherine Burns were returned to Ireland for burial in their native soil. 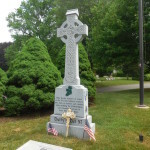 The remains of the others were buried under a Celtic cross at a memorial at West Laurel Hill Cemetery near Philadelphia in March, 2012. Photos of the memorial are shown. 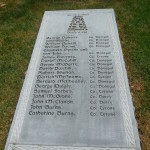 The names of the victims at the memorial were determined from genealogical research on the passengers of the ship “John Stamp” and who were certainly members of the Duffy’s Cut work crew. The remains of the other missing workers were moved to a different site when the railroad line was straightened in the 1870s. It is believed that they are in a mass grave in the vicinity of a stone memorial wall erected by the railroad around 1909. At the present time, no excavation work can be done at that site because of the proximity to the rail line. Thanks to William and Frank Watson and the rest of the project team for this information. Much more information is available on the internet. Carrickabraghy Castle is located on an outcropping of rock at the southern entrance of Trawbreaga Bay in the Inishowen Peninsula, County Donegal. 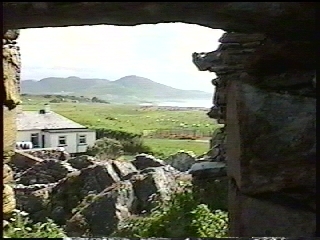 The castle protected a small peninsula in north-western Inishowen known as the Isle of Doagh. (It was an island once in prehistory). 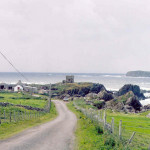 In pre-Viking years, Carrickabraghy (as well as the Isle of Doagh) was ruled by the Cenel Coelbad, descendants of Eoghan (who was son of the Irish High King, Niall of the Nine Hostages). 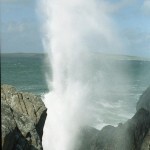 Coelbad was the grandson of Eoghan. 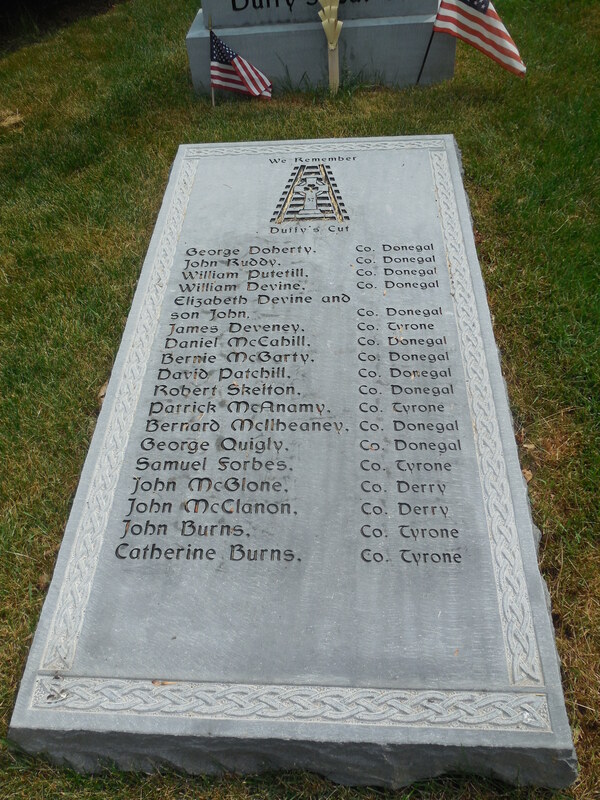 Many Irish septs are descended from the kings of Carrickabraghy, including my own (O’Gaillin). 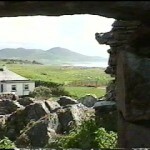 From forts located at the site of the present castle, the kings of Carrickabraghy defended Inishowen from attacks. 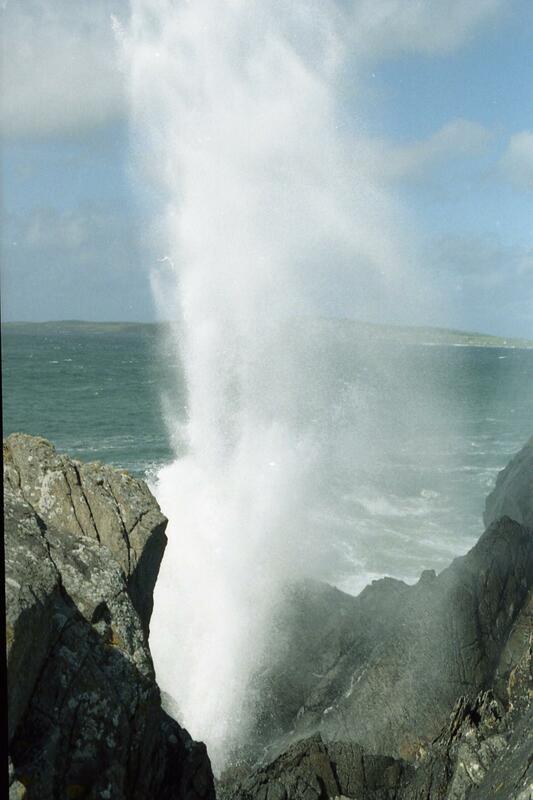 From the 9th century onward,the land was ruled by the O Maolfabhail (McFall) sept who protected Inishowen from Viking raids and raids by other foreigners. 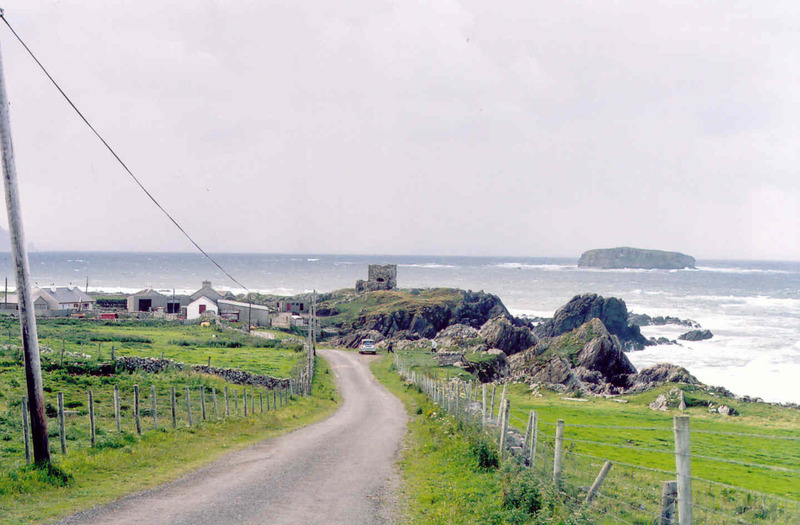 Sometime after 1200 AD, the rulers of Inishowen came from the O Dochartaigh (O’Doherty) clan. 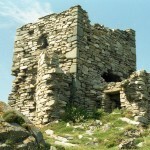 Carrickabraghy Castle was probably built around 1590 by Phelim Brasleach O’Doherty. 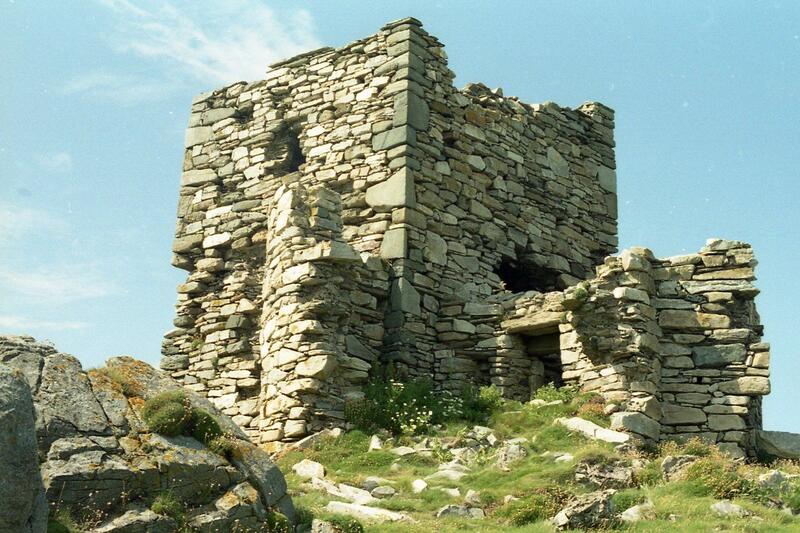 It was one of a chain of several O’Doherty castles that protected the peninsula. 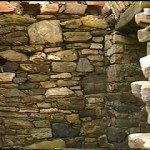 The castle was originally built with a keep and two towers surrounded by a bawn wall. Today the castle ruins has only the keep and part of one tower. One of the castle’s famous residents was young Sir Cahir O’Dohery, Lord of Inishowen. Cahir took the English side in the Nine Years War with the Irish Earls. At the conclusion of the war, he was suspected of planning to retake Ireland with help from Spain. He began a poorly conceived rebellion in 1608 when he captured and burned Derry City, Strabane, and other English controlled sites before being defeated and killed near the Rock of Doon in Kilmacrenan, Donegal. 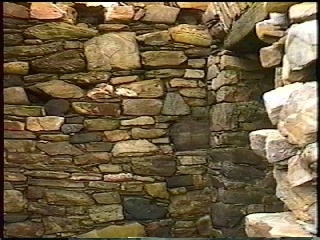 This video by Peter Homer is an aerial view of the castle.